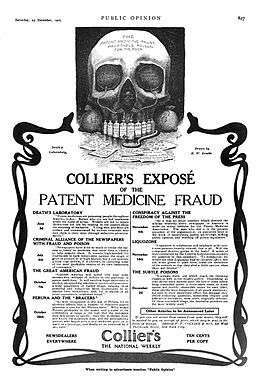 Collier's was an American magazine, founded in 1888 by Peter Fenelon Collier. It was initially launched as Collier's Once a Week, then changed in 1895 to Collier's Weekly: An Illustrated Journal, and finally shortened in 1905 to simply Collier's. The magazine ceased publication with the issue dated January 4, 1957, though a brief, failed attempt was made to revive the Collier's name with a new magazine in 2012. In 1924 Crowell moved the printing operations from New York to Springfield, Ohio but kept the editorial and business departments in New York. Reasons given for moving print operations included conditions imposed by unions in the printing trade, expansion of the Gansevoort Market into the property occupied by the Collier plant and "excessive postage involved in mailing from a seaboard city under wartime postal rates. After 1924, printing of the magazine was done at the Crowell-Collier printing plant on West Main Street in Springfield, Ohio. The factory complex, which is still standing, was built between 1899 and 1946, and incorporates seven buildings that together have more than 846,000 square feet (78,600 m2)—20 acres (81,000 m2)—of floor space. Leading illustrators contributed to Collier's, including Chesley Bonestell, and Charles R. Chickering who later became a chief designer of U.S. Postage stamps. Other accomplished artists included Harold Mathews Brett, Howard Chandler Christy, Richard V. Culter, Harrison Fisher, James Montgomery Flagg, Robert Fawcett, Alan Foster, Charles Dana Gibson, Denver Gillen, Percy Leason, J. C. Leyendecker, Paul Martin, John Alan Maxwell, John Cullen Murphy, Maxfield Parrish, Frederic Remington, Anthony Saris, John Sloan and Frederic Dorr Steele. Collier's circulation battle with The Saturday Evening Post led to the creation of The Collier Hour, broadcast 1927–32 on the NBC Blue Network. It was radio's first major dramatic anthology series, adapting stories and serials from Collier's. The hour-long program initially aired on the Wednesday before weekly publication, but switched to Sundays to avoid spoilers with stories that appeared simultaneously in the magazine. 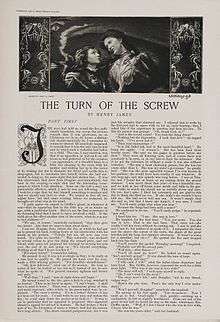 In 1929 the program began to incorporate music, news, sports and comedy with the dramatic content of the show. The magazine ceased publication with the issue for the week ending January 4, 1957. ↑ "Collier's Weekly, Issues of 1942". ↑ "About Us", Collier's, February 2012. 1 2 3 4 5 6 7 Mott, Frank Luther (1957). A History of American Magazines, Vol. IV. Cambridge, MA: Harvard Press. pp. 453–479. ISBN 978-0674395503. ↑ "Falls Dead in the Riding Club Early This Morning. Doctor Too Late. Head of Publishing House. 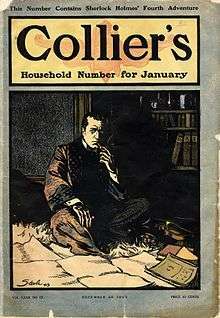 Worked His Own Way Up from a Humble Beginning to Ownership of Collier's Weekly". New York Times. 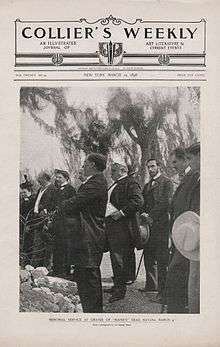 April 24, 1909. Retrieved 2011-11-18. 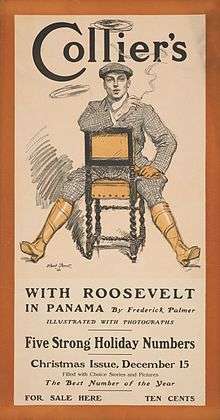 Peter F. Collier, publisher of Collier's Weekly and well known in society here and abroad, dropped dead of apoplexy in the Riding Club, at 7 East Fifty-eighth Street, early this morning. Mr. Collier had been attending the annual horse show which the club gives, and death overtook him as he was descending the stairs to the street. 1 2 "Collier's Plant to Move to Ohio; Publication Follows Others That Have Left New York Because of Union Conditions". The New York Times. Retrieved 2016-04-17. ↑ Weber, Bruce. "Knox Burger, Agent and Book Editor, Dies at 87". The New York Times, January 12, 2010. ↑ Wyndham, John. The Day of the Triffids, Fawcett Crest #449-01322-075, sixth printing, April 1970. ↑ Weart, Spencer (October 2005). "Spencer Weart on Depicting Global Warming". Environmental History. 10 (4): 770–775. doi:10.1093/envhis/10.4.770. ↑ Morrone, Francis (2008-09-25). "Scenes at N-YHS". New York Sun. Retrieved 2010-10-27. ↑ "This Little Gag Went...", Time, August 12, 1946. ↑ Dunning, John (1998). On the Air: The Encyclopedia of Old-Time Radio. New York: Oxford University Press. pp. 163–164. ISBN 978-0-19-507678-3. ↑ January 26: 60th Anniversary of Hale Telescope "First Light"
↑ Collins, Martin J. After Sputnik, HarperCollins, 2007. ↑ Crowell-Collier Publishing Company, Abandoned. Retrieved 2013-10-16.